The C++ standard defines rules about how programs should behave in specific circumstances. And in most cases, compilers will follow these rules. However, many compilers implement their own changes to the language, often to enhance compatibility with other versions of the language (e.g. C99), or for historical reasons. These compiler-specific behaviors are called compiler extensions. Writing a program that makes use of a compiler extension allows you to write programs that are incompatible with the C++ standard. Programs using non-standard extensions generally will not compile on other compilers (that don’t support those same extensions), or if they do, they may not run correctly. Frustratingly, compiler extensions are often enabled by default. This is particularly damaging for new learners, who may think some behavior that works is part of official C++ standard, when in fact their compiler is simply over-permissive. Because compiler extensions are never necessary, and cause your programs to be non-compliant with C++ standards, we recommend turning compiler extensions off. 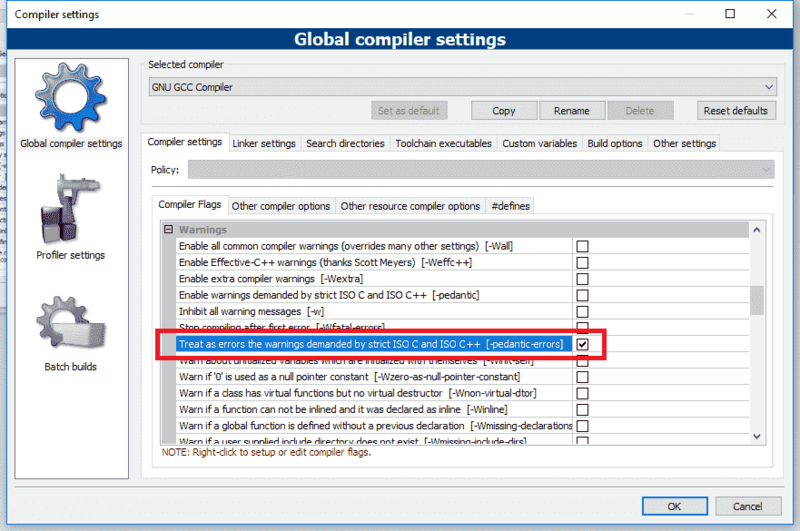 Disable compiler extensions to ensure your programs (and coding practices) remain compliant with C++ standards and will work on any system. Then, click C/C++ > Language tab, and set Disable Language Extensions to Yes (/Za). Disable compiler extensions via Settings menu > Compiler > Compiler flags tab, then find and check the -pedantic-errors option. You can disable compiler extensions by adding the -pedantic-errors flag to the compile command line. any specific configuration required for Kdevelop c++ cmake terminal project? There should be a CMakeLists.txt file in your project. Does Visual Studio 2017 have a default setting to disable these extensions permanently? I haven't been able to find it myself, but that's not saying much. Not that I've found, which is pretty unexpected. You can create a project template and use that whenever you create a new project. 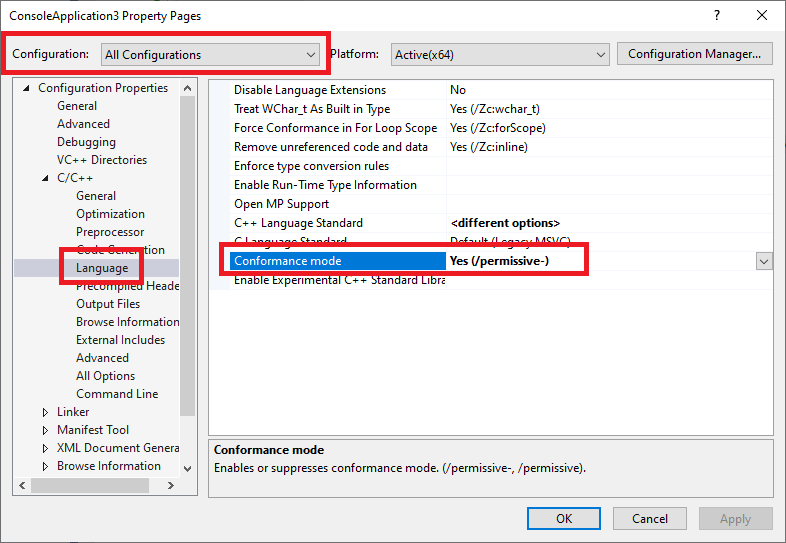 Alex, I would recommend for VS2017 users you mention the conformance mode (/permissive-) just below where language extensions can be disabled. It is on by default, so VS can check if the C++ conforms to the selected C++ standard (C++14/C++17/C++latest). I don't mention it because it's on by default. Is there some specific reason you think it's worth calling out explicitly? Using Xcode Version 10.1 (10B61). Not sure how to turn off compiler extensions here. Any idea? Thanks for the tutorials I am loving them so far but I am using CLion and MinGw to compile and can't find a similar setting can anyone assist me to find the setting or is it disabled by default in CLion? i got most of it. i mean i hope i did. but i still don't get how to write all those coding in each line. almost none of the options in HelloWorld project properties shown in your screenshots appear in mine. am I dong something wrong? did I not install the right package? 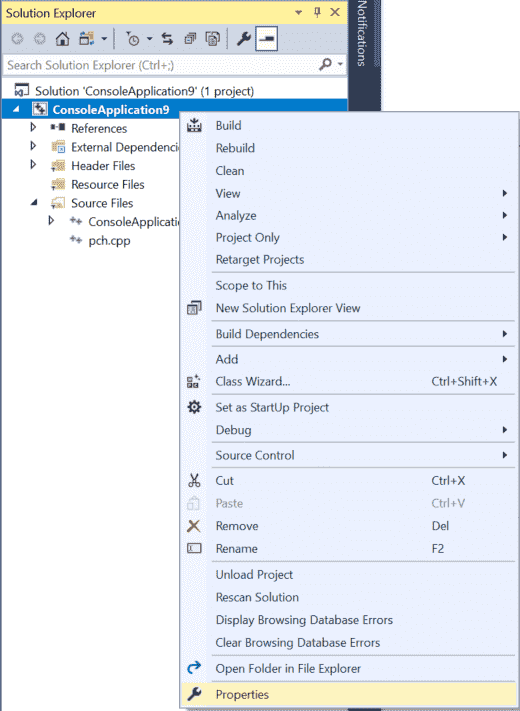 Were you able to create your project as a win32/windows console project in the first place? For mac users we were told to get xcode as our compiler but now there is no instruction for it. Please help. I came to learn C++ but now can't get through Chapter 0. The steps in this lesson are highly recommend, though not mandatory. You can continue to the next lesson. I just finished disabling language extensions for the HelloWorld project. Do I have to do it again every time for future projects? Unless your IDE has a way of changing the default settings, yes, you have to do it for every new project. Should that be left checked? Sorry if is a dumb question but I know nothing about working with a compiler and only have used perl and php and want to have as much right as possible. If that's the newest supported version, yes. If there's a newer version of C++ available in your compiler, use that. codeblocks-17.12mingw-setup.exe from Sourceforge. When disabling the extensions was when I noticed. How can i disable the complier extensions on Xcode? I have searched sound a bit and can't find anything on it. Is there something better I could be using on a mac? I could even install windows on another portion or something it it would be easier to use windows. What do you think? std::cout << "The sum of 5 and 7 is "
I just find it easier to read and my compiler seems to have no problem with me not putting the semicolon at the end of every line. Am I screwing up my learning in any way? gcc compiles C, g++ compiles C++. > Am I screwing up my learning in any way? Can you share the exact error message you're getting? The compiler will throw an error telling me that #endif is illegal, but if I delete it, it will tell me that #endif is missing. Can you please tell me what is the problem here? Thank you. If you remove all of the "// some code here", does it work? Does it work if you disable compiler extensions again? I think I have found the problem, it seems like when I disable the compiler extension, I must press enter after the "#endif" preprocessor to make a newline. If I enter a newline, the program will compile, and vice versa. This have confused me a lot, if the compiler extension is unnecessary and potentially dangerous, why did they include it in the compiler in the first place? TJ Seabrooks and Rakete1111 posted a nice explanation on stackoverflow ( https://stackoverflow.com/a/72409/9364954 ). Omitting the line feed at the end of a file could cause problems prior to C++11. Every C++11 and newer compiler should automatically add the line feed and not complain. To my understanding -pedantic only disables extensions that prevent standard-conform programs from compiling and issues warnings when other extensions are used, but allows compilation. -pedantic-errors disables all extensions. Thanks, I missed that nuance. Lesson updated!